Wilson brings joy and technical finesse to the listener, integrating music from diverse backgrounds and different ages with a compelling story and a wry sense of humor. Wilson has distinguished himself as a unique voice with programs that feature his own transcriptions of the well-known and the obscure. Wilson’s compositions for the guitar have appeared throughout the Northwest US and Canada. 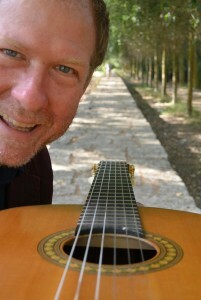 Wilson has taught at Whatcom Community College, Bellevue College and the Rosewood Guitar. Wilson’s CD El Sueño del Camino 2015 was the product of a series of concerts performed along the Camino de Santiago in Spain. His latest CD, Pilgrimages 2018, features music he wrote or arranged for the Guitar Orchestra of Seattle. The inspiration for the music on the CD were his experiences playing along the Camino de Santiago, but the summer of 2015 made him realize the struggles we have in our own country and he wrote two new pilgrimage pieces, one dedicated to the legacy of Martin Luther King and the freedom march, and a more personal one inspired by Chuckanut drive. Wilson’s current projects are recording music that he compiled on a tour of Spain last fall and working with Sarah Bassingthwaighte, flute and Stacey Mastrian, soprano in the Ecco Chamber Ensemble. They build concerts around the intersection of art and social change. The trio came together in 2016 with the aim of programming thought-provoking classical music that asks us to consider our common humanity and sheds light on issues of our time. Concerts have focused on homelessness at local and international levels, environmental issues, gun violence and other atrocities, our interaction with technology, and music’s profound impact on education and on us as human beings.